The above graphic shows the result of an estimate by the Tax Policy Center (TPC) of the distribution of the shares of both income & federal income taxes paid in 2014 by all 325 million Americans divided into quintiles of 65 million people in each quintile. Tax Report columnist Laura Saunders writes in the WSJ that "unlike IRS data, it includes information about nonfilers – both people who didn't need to file & people who should have filed but didn't. The total also includes Americans living overseas & others, which is why it is greater than the U.S. Census estimate of 319 million." Saunders adds "Another important difference: The income cited includes untaxed amounts for employer-provided health coverage, tax-exempt interest & retirement-plan contributions & growth, among other things. This can be significant." Yes, receiving employer provided healthcare insurance @ no out of pocket cost in an income tax system is quite a significant benefit for those who earn it as part of their total compensation. Please be assured that no employer provides this benefit for any reason other than being competitive for talent in the labor market in their search for people whose education, training & experience meets the employer's needs. So many people work just to keep healthcare insurance through their employer or are looking for work with good healthcare insurance & yet do not consider this benefit as income although if pressed they would have to admit it is a significant part of their total compensation that is earned. 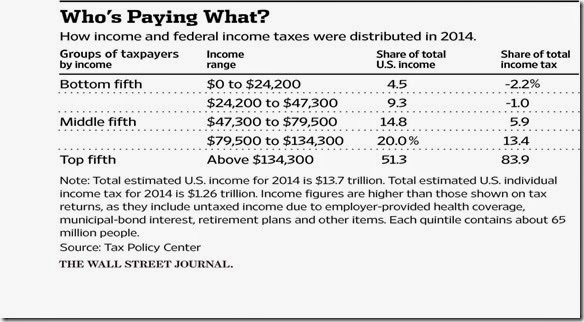 Although the above TPC estimate is for federal income tax payments only, the overall distribution follows the same top quintile pays the overwhelming majority of federal taxes profile when payroll taxes of Social Security & Medicare are included. It is the return of cash payments of these payroll taxes to people who do not pay any federal income tax that result in 40% of Americans' share of federal income taxes being negative @ –3.2% as shown on the graphic. 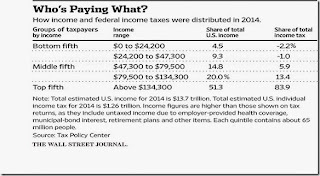 Even more insidious - the graphic shows that close to 80% of the people pay either no federal income tax or so little federal income tax that tax reform is of little or no interest to them meaning that America is stuck in a rut where statist politicians can present shams like income inequality, raising the minimum wage, & class warfare that hold back & actually thwart tax reform that would result in economic growth & prosperity for all. 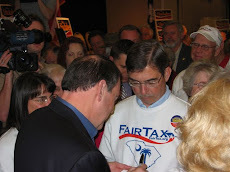 In this regard I wrote two posts ago "Congressman Woodall learned in 2014 that the Joint Committee of Taxation has no methodology to properly evaluate the FairTax meaning that it will not come out of the Ways & Means Committee onto the floor of the House as it stands. It is like the House statists have checkmated the FairTax into the corner of W&M where they plan to keep it." 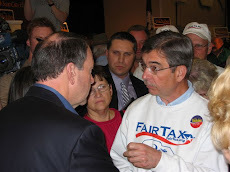 With the FairTax bottled up in a bureaucratic dead end this leaves us some Republicans talking about an undefined flat income tax that stirs up some conservatives while others talk about tinkering around the edges of the current income tax code – falsely calling either meaningful tax reform. Estimates of foregone investments and consumption resulting from the federal income tax system increase the deadweight loss to the economy every year – Professor Martin Feldstein calculates a recent fiscal year deadweight loss due to the federal income tax to be $385 billion or 2.55% of GDP. The above 2014 distribution duplicates similar results for 2013 – the TPC determined that a middle class family of four paid only 5.3% (effective tax rate) of its income in federal income taxes & the CBO determined that overall federal taxes (income, payroll, excise, & imputed corporate taxes) for such a family were @ their lowest levels in decades. 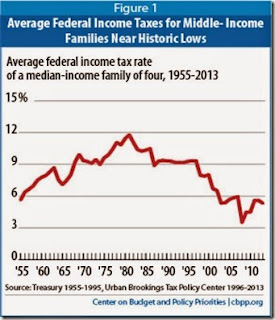 See graph below for effective federal income tax rates for a middle class family of four. So with the FairTax slowed down in W&M & no other compelling Republican tax reform message taking hold to date it is easy to see how far too many people in the bottom 80% of income earners consistently fall for Democrat tax the rich schemes that vilify millionaires & billionaires. This 80% don't pay much in taxes & they also don't make much money if they are working @ all – the majority of these people are not happy & prefer to close any perceived income inequality by bringing the top earners down since they don't hold much hope for going up themselves. Confiscation of wealth is @ the end of this road to ruin we are travelling. But we need to recognize that it is not taxes but rather what we spend money on that is the enemy – namely Social Security, Medicare, & Medicaid entitlements, interest on the national debt, & the 126 welfare programs recognized by the Cato Institute. These entitlements & programs take money from the high income earners & give them in one form or another to people in the lowest three quintiles. For instance Scott Hodge of the Tax Foundation determined that the average middle class family receives over $7,000 more in benefits than they pay in federal taxes each year. See table below to see what the top 20% of income earners pay – you have to reach the 90 to 95 percentile of income earners in order for the share of income to equal the share of federal income taxes paid. This means that far too many people don't have skin in the game or think they don't. But they do. Their entire way of life is about to be changed forever, if it hasn't already, to one of government dependent socialism. Trying to eliminate or reverse a welfare state that has taken hold in the apathy to dependence stage of an entitlement society like it has in America has always been a political loser throughout history & every Republican & Libertarian candidate for president is facing this losing compulsion. Even President Reagan, 35 years ago, could only slow, not reverse this course. Hillary Clinton opened her official campaign for president saying "the deck is still stacked in favor of those @ the top." A more accurate statement would be "the Democrat deck is stacked against everyone who has not educated themselves properly to support themselves & who relies on government for nourishment & safekeeping" – namely the people who currently support her & can't see her programs will keep people down. But the worst part of socialism to me is that it cheats people out of reaching the potential in life they were born to live. They will never experience the thrill & triumph of high achievement - the highs of life that Ayn Rand wrote about in We The Living - so that to reverse paraphrase TR - everyone's place will always be with those cold & timid souls who know neither victory nor defeat. As such the true cost to any socialist society, namely the opportunity cost, is more than just enormous - it is literally unimaginable. Doug – outstanding job in presenting the tax paying status per income level. The current status has led many Americans to look to the Government for security and entitlements. This then has widened the income gap between the top earners and many in the middle-lower levels. Those who improve their income earning capacity (and have fun doing so in their chosen professions) are the ones who thrive even in tough economic times. The goal then is for all Americans to develop their God given talents and skills. Otherwise complacency sets in and the citizenry in large part then votes for politicians who promise to maintain, even increase entitlements, and to further tax the high income earners. The economy then staggers; we witness that now. The above scenario presents a huge obstacle for GOP presidential candidates. They are accused of being insensitive to income inequality. However, they must strongly and concisely explain why applying oneself in the private economy and as an entrepreneur are the best ways to decrease income inequality. I have a bias for presidential candidates with a proven record of private economic success. I was greatly disappointed with Romney, an utterly poor campaigner. I have hopes however that a Carly Fiorina candidacy can succeed where Romney failed – a clear message that championing our entrepreneurial spirit and developing private economy skills result in a most robust economy. In the process, Carly citing her personal career successes, could then persuade many that current Democratic economic and social policies result in the War on Women, another key issue GOP must master if it has any chance of winning in 2016. Finally let’s win by clearly explaining how our economic policies can enhance income earning capacity for all. Then we’ll work on the Fair Tax, touting its incentives for entrepreneurial activity while maintaining a progressive tax structure but where all have a role in paying taxes. We will then look forward too much better graphs and tables from you within 4 years.